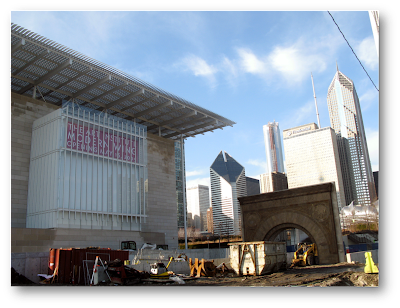 When the Modern Wing at the Art Institute of Chicago opens on May 16, 2009, you are in for a treat. The galleries and the building are elegant, uplifting spaces, beautifully detailed. They should support the art very well, and not overwhelm it. 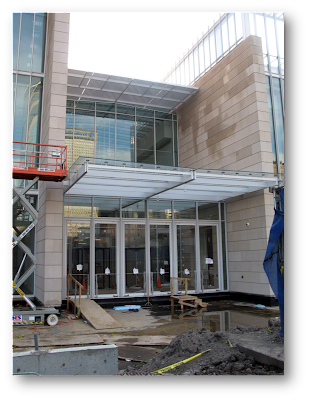 This is the highest quality design and craftsmanship seen in a public project in Chicago since Millennium Park. I guess you still get a lot for 300 million dollars, the budget here. 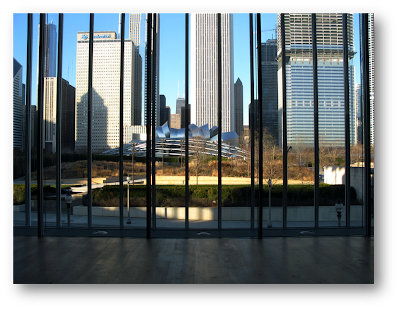 Unlike so many twisting, over-reaching museum buildings that have come on the scene of late, Chicago wisely went for understated architecture that will not date quickly, with its neo-classical symmetry and elegance. The expansion will increase the size of the museum by more than one third. 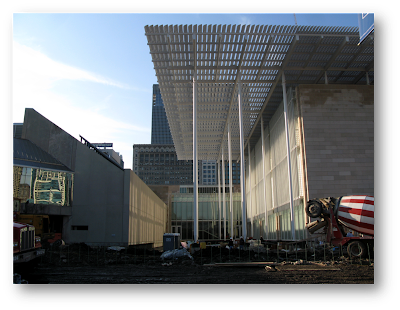 It’s the largest (and best) expansion to the museum since it opened one hundred and thirty years ago. 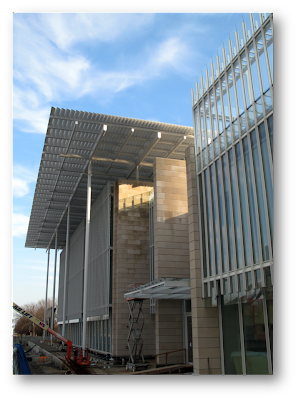 The exterior is limestone, like most of the museum; and for those who are counting, this adds more than 250,000 square feet. of the Modern Wing of the Art Institute of Chicago. You’re looking south here. This is what’s called the “main street” of this project. It runs all the way into the old building and provides a new north-south axis to the museum that until now was mainly organized east-west. Officially this double-height space is called the Griffin Court, after the high-flying hedge fund manager and art collector — as in $80 million dollars for a Jasper Johns painting — Kenneth Griffin of Citadel Investment Group. He and his wife Anne are said to have had one of their first dates in the Art Institute, and well before the current economic mess we’re all in, (and I’m sure he lost more than I have), Mr. Griffin made a generous donation of about $19 million dollars and got the court named after him. 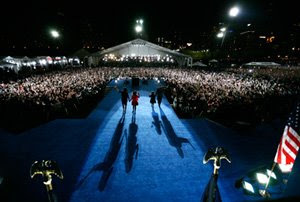 This makes you realize we’re lucky that the project broke ground in 2005. A $300 million dollar addition like this would not be planned in the current economic conditions. It also drives home the point that the Art Institute did not sell naming rights for the entire wing. Bravo! “The Modern Wing.” That’s nice Midwestern straight talk and modesty. On the right of the Griffin Court is a long north-south gallery building. The first floor will be galleries for special exhibitions– the first will be works by Cy Twombly. The second floor will be galleries for Architecture and Design! Finally, they get their due at the Art Institute of Chicago. 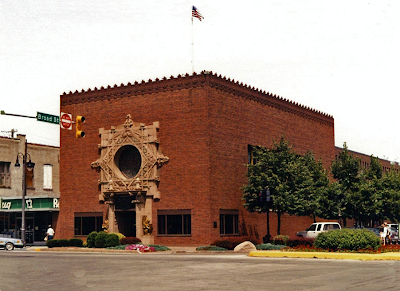 Space for architecture and design exhibitions will almost triple, up to about 7500 square feet. 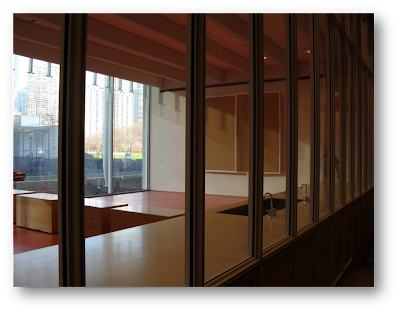 Elsewhere on the ground floor of the Modern Wing you’ll find an admissions desk, coat room and shop; plus galleries for photography, and electronic media. Notice in the photo above, on the left side, the nice “quote” Piano offers Chicago — a Mies van der Rohe style “floating” staircase, like the masterpiece Mies designed for the Arts Club of Chicago. There’s Mies’ stair. 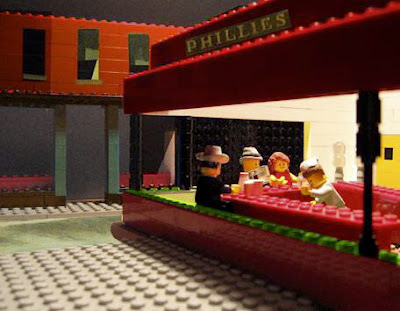 Piano is a big fan of Mies. 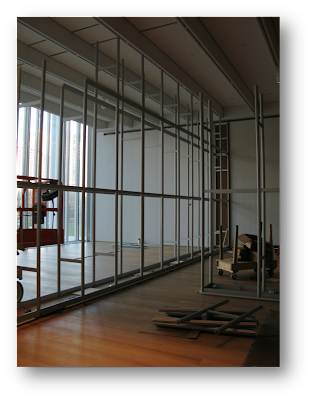 I once walked with him through Mies’ New National Gallery in Berlin, and he spoke of the beautiful clarity in Mies’ manner of expressing structure and also said he appreciates the way Mies uses reflections and transparency. Back to the entryway. On the left, just past the “homage” staircase, where you see the light coming in, you’ll find a new garden. 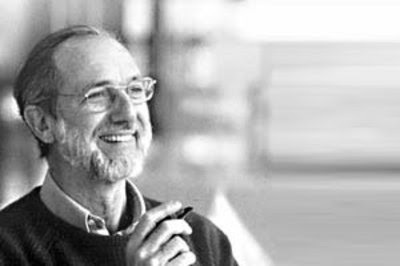 Renzo Piano is a master of the confluence of Nature, Architecture and Art. He loves to display vegetation, through large glass walls, to bring nature indoors. He’s done this to superb effect at the Menil Collection in Houston, his masterpiece Beyeler Foundation museum in Basel, and at the New York Times building. It is very satisfying, particularly in an urban environment. Much good architecture, like art, is based on nature and he is wise to provide us with the connection. Besides the architecture and the light and space and sound in the entry court of the Modern Wing you won’t find any art displayed. It’s not even climate controlled enough for art. 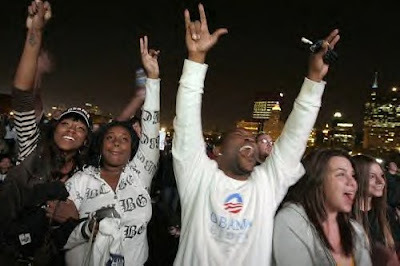 But it will be suitable to rent out for functions and it’s already in demand. 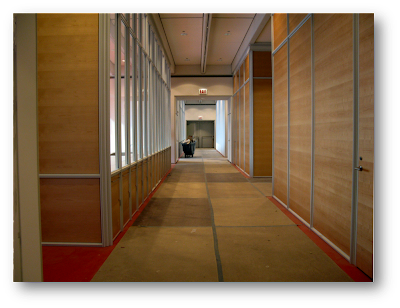 Piano’s foyer in Chicago gives us a modern asymmetry, and novelty. 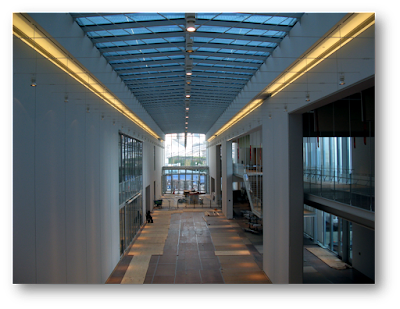 But the structural ribs that help hold up the roof repeat with regularity for the length of the ceiling. As you walk through the foyer you’re aware of their rhythm, their repetition, and of the repetition of the module that they create up above. The visually regular “beat” gives us the sense of a humanist, ordered, 19th-century glass-covered arcade; with the added pulse of the mystical mathematics of the Renaissance. Yes, Renzo Piano at his best is capable of all that. 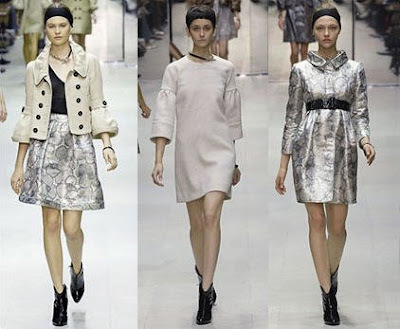 Few of today’s designers are. 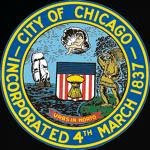 Chicago is known everywhere as the first city of modern architecture. 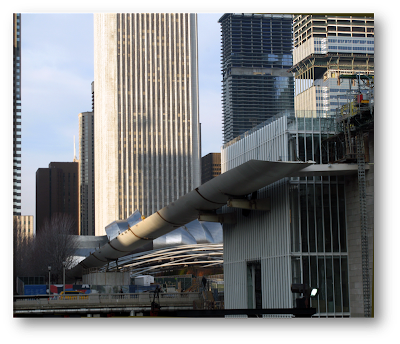 Here you are building within the great tradition of our own time, but also within sight of the immense open lakeshore, within steps of a vital city center, just across from Millennium Park. 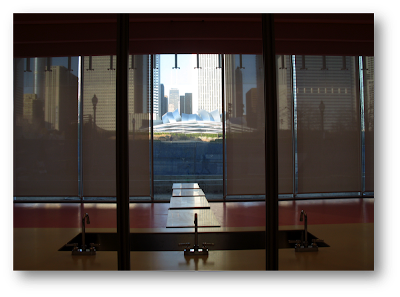 My desire was to root the Art Institute’s building deeply in this ground, but at the same time to give the Modern Wing air and lightness—to let it levitate. 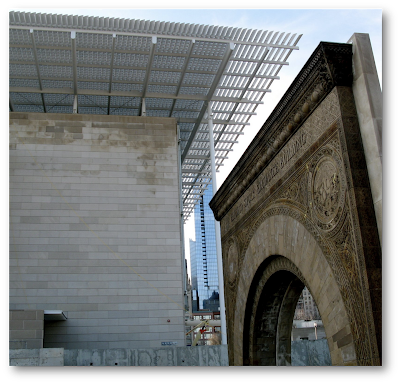 A continuation of an urban fabric, a flight into new experiences: this is what I have hoped to achieve, for Chicago and for one of the world’s best-loved museums. 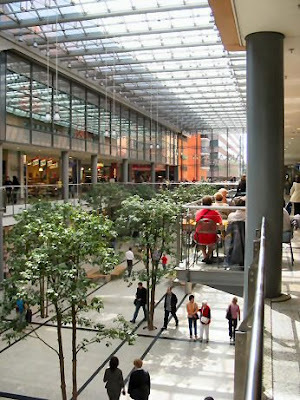 The Art Institute foyer or “court” also reminds me of Renzo Piano’s long, narrow, lit from above with natural light “Arkaden” shopping mall at Potsdamer Platz in Berlin. Once again we see how museums have become places to “consume” culture. But while the malls in Milan and Berlin feature shops left and right the Art Institute Modern Wing offers you elegant rooms in which to look at art. On the right, you see the new galleries for Architecture and Design. Much larger and better space than what those departments currently have. But most of the new galleries are in the large square to the left of the entry court. Let me say here that the Michigan Avenue entrance into the original 1892-3 Beaux-Arts palace is expected to remain the principal entrance. You can enter from Michigan Avenue, wind your way through Asian and other non-Western art, and antiquities, medieval, Renaissance, Baroque and so on up to the end of the nineteenth century — at which point you’ll find a door. Open it, to enter this new Modern Wing, for 20th- and 21st-century art. The progression is well thought out. And the passage from old art/old building into the new should be satisfying. Going this way, you will enter the Modern Wing on the second floor. 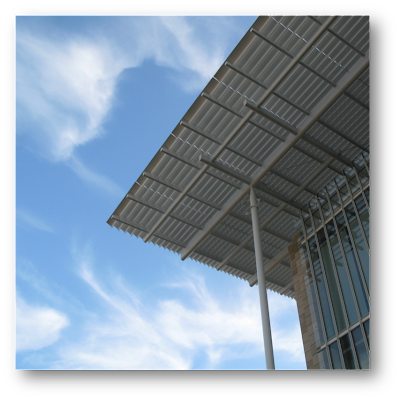 There you’ll find the Art Institute’s 20th- and 21st-century European painting and sculpture, contemporary art, photography, and architecture and design. 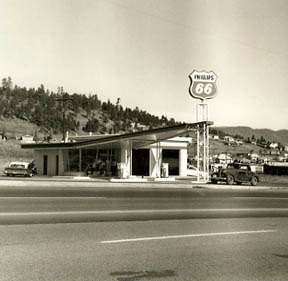 The architecture and design galleries will house temporary exhibitions and show pieces from the permanent collection. What a view! What a city! 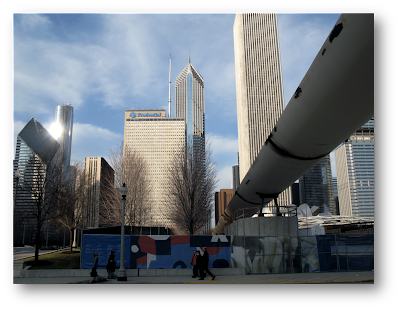 That’s Millennium Park, with the Frank Gehry bandshell. What a gallery! I like the trend of connecting galleries to views of the city, rather than blocking out all natural light and urban connections. Of course, walls are being constructed in these elegant rooms, on which to hang art. So, unfortunately, but necessarily, we won’t get many of the great unobstructed views seen above. 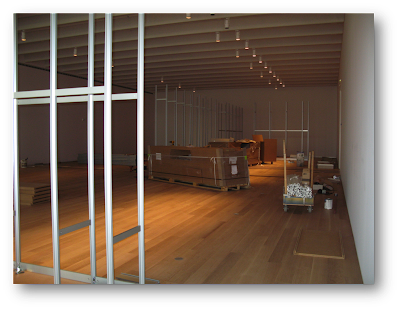 You can see the galleries are nicely proportioned and nicely finished. They could be larger, especially for contemporary art, but a wonderful aspect of Chicago’s Art Institute is that it doesn’t overwhelm you; doesn’t exhaust you. Almost everywhere you have an intimate relationship to the art on display, and it looks like that will continue here in the new wing. What would a Modern Art museum in America be without a Sol Lewitt wall drawing? They nearly all have them. Click here and here to see what these are all about. 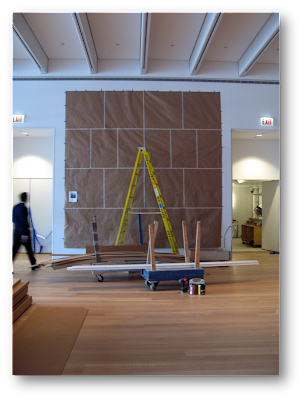 The Art Institute will mount Wall Drawing #63, which it acquired in 1985. It has been “up” once, perhaps twice, since acquisition. When you go upstairs to the third (and top) floor, you get similarly gorgeous galleries, and these are lit with natural sunlight, masterfully manipulated by the scrims and the “flying carpet” structure of the roof. It’s a white, extruded aluminum sun-screen of cantilevered blades. They capture the north light and send it into the top-floor galleries. 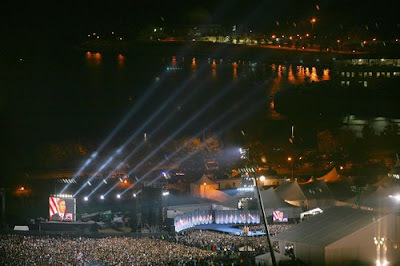 The system is designed to adjust to minute fluctuations in light. Photovoltaic cells in the window scrims and computer-controlled artificial lighting are supposed to keep light levels consistent. 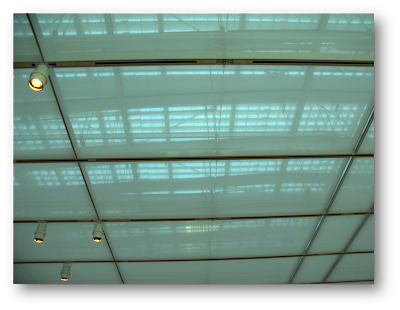 Renzo Piano Building Workshop (RPBW) is among the best at manipulating natural light in rooms for looking at art. 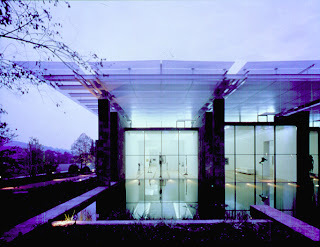 See their Paul Klee Center in Switzerland, or the Nasher Sculpture Garden in Dallas, or again, the Beyeler Foundation in a suburb of Basel, Switzerland- in fact, here’s a view of the highly-acclaimed Beyeler. See the similarities? A floating roof (“flying carpet” Piano calls them both) to manipulate the light. A classically inspired three-part façade. Flat planes of stone projecting out into space. A strong combination of nature, architecture and art. 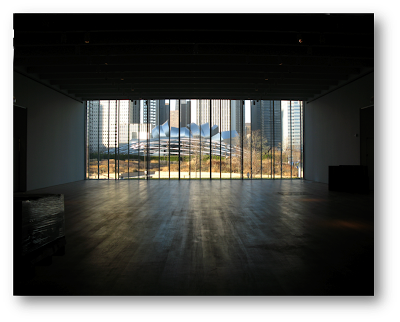 Interesting that for Piano’s largest museum project to date – Chicago- he chose to drawn on what many consider his best museum – the Beyeler. 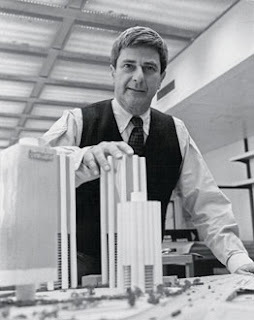 Often when artists enlarge their works, that is, increase the scale, the design falls apart. Failure ensues. Due to scale, Chicago may not be the jewel that the Beyeler is, but Piano has done an expert job of keeping the sensitivity of his earlier, more intimate work. 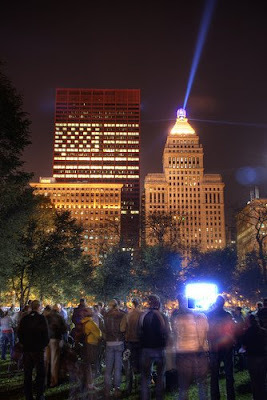 And it’s exciting to see it recast at urban scale for Chicago. 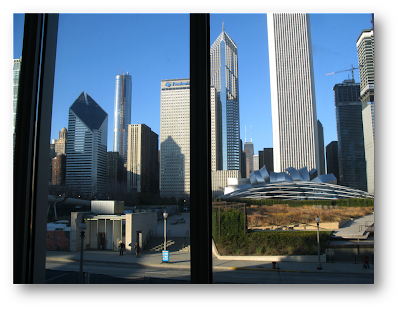 – as in Chicago, a wing for contemporary art attached to an encyclopedic museum (the L.A. County Museum of Art) – I can say I much prefer the work in Chicago. It’s far more elegant both outside and in. In L.A. the outside is a forbidding, too-solid, stone box. The light is nice in the top floor galleries, coming through metal fins and treated glass and then scrims, as in Chicago. I find Chicago’s ceiling composition to be more pleasing. 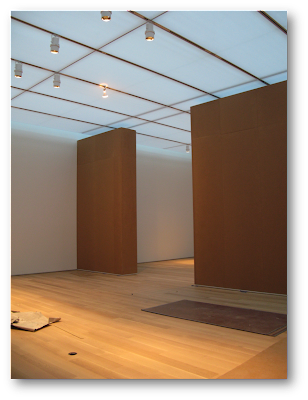 In L.A. RPBW put ventilation grills in the floor of the galleries. 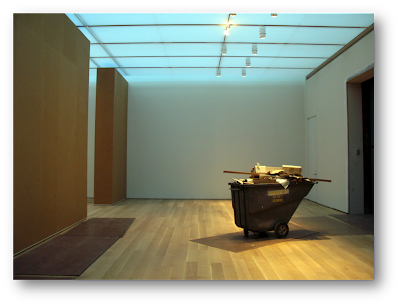 They create dark lines in the floor, which have no relationship to the temporary walls that curators build, and the thick dark lines on the floor distract your attention from the art on the walls. I’m glad we don’t have those in Chicago. Where the third floor views are the most stunning, through the double panes of glass, which make everything quiet and serene. The third floor will feature European painting and sculpture since approximately 1900, including works by Picasso, Matisse, Kandinsky, Brancusi, and Giacometti. The new building will allow the Art Institute for the first time to display these works in galleries filled with natural light. Renzo Piano Building Workshop is one of the busiest firms in the world. And at some of their projects the detailing is exquisite. At others it is less so. You’ll be pleased with the detailing in Chicago. It is fine throughout the Modern Wing. 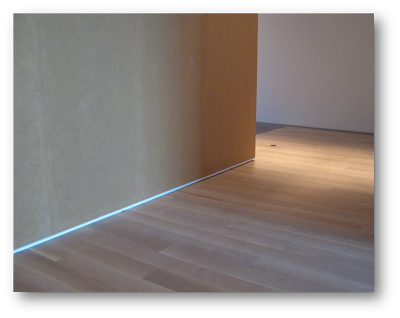 Notice the slight indentation (called a ‘reveal’) when the gallery walls meet the floor. (It won’t be as prominent when finished.) This makes the floor seem to float, it makes it seem less solid, makes the space for art seem more ethereal. Look at the glass staircase. Glass in this building is for looking out at the city; also to reflect the city. Take the stairway down to the first floor. 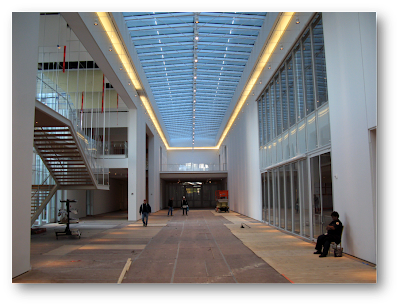 Much of the space in the new wing will be devoted to Museum Education. It’s on the ground floor, easily accessible, free of charge, no need to pay museum admission. 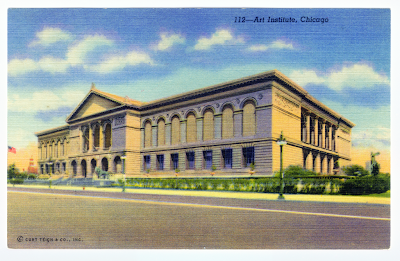 The Art Institute will double its space for Museum Education. 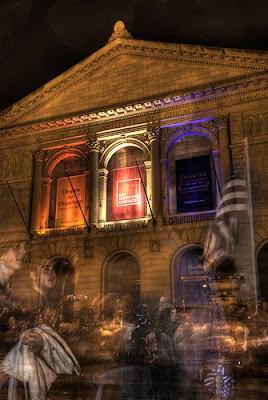 To inspire a cultured populace and future generations of visitors to the Art Institute! You enter this directly off of Monroe street. Walk through the birch-lined corridor. You’ll find 20,000-square feet of classrooms and studios for school kids and families. Again, Piano let the natural light pour in. 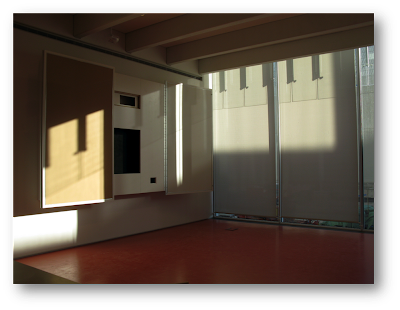 At times the light is almost Edward Hopper-esque, as in this room, which fronts a new garden. 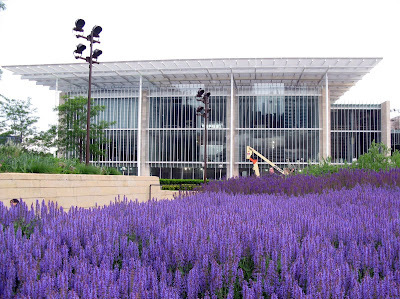 Read my next post on the Art Institute to find out who is designing the garden. 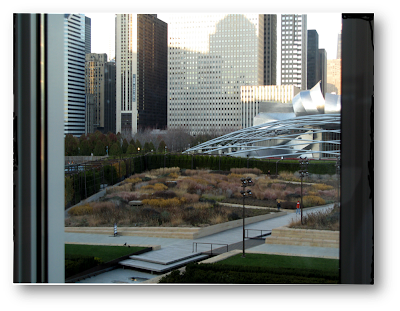 This view is from Columbus Avenue, between the new Modern Wing of the Art Institute, and the old east entrance to the museum. 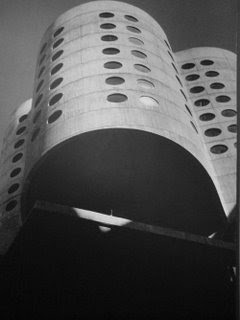 Read about it, and I’ll tell you about the exterior of the building (which I find too large for its site) in my next post. 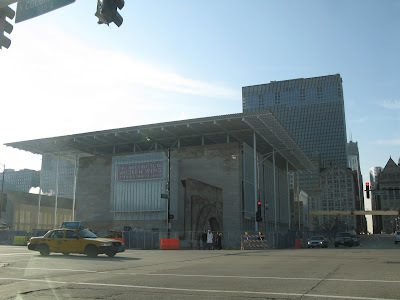 When the Modern Wing opens on May 16, 2009, the Art Institute of Chicago will be the second largest museum in the United States in square footage, behind the Metropolitan Museum of Art in New York. I’ll also write soon about the 620 foot long bridge also designed by Renzo Piano Building Workshop. 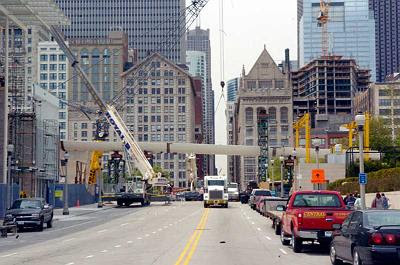 In daring Chicago structural style it will span Monroe Street with few supports, and fly above the street (what a view from there!) 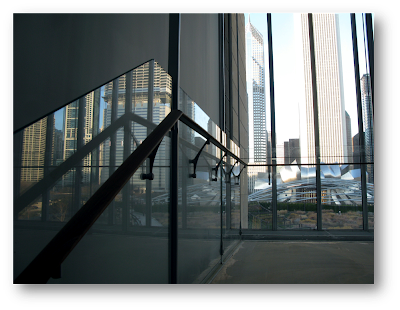 to the third floor restaurant and to the admission free third floor sculpture terrace of the Art Institute. Those unseemly seams in the steel will come out and the bridge will be painted. of the Art Institute of Chicago. You are currently browsing the archives for the Art Institute category.